Dr. Alfred J. Ralphy, born in Nashville in 1854, practiced medicine in Brown County for fifty years until his death in 1928. He began his practice in New Bellsville in Van Buren Township. The doctor never owned an automobile and made all house calls on horseback and with a horse and buggy or sleigh. He carried medicine and his instruments in a saddlebag. He was known for his hobbies. He was a self-taught taxidermist. 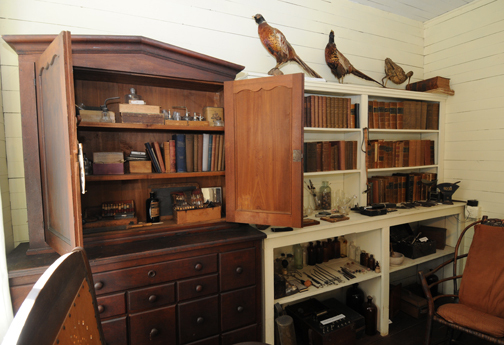 Hundreds of Brown County birds were displayed in his office—all of his own mounting. He collected insects native of Indiana and had a large collection of precious stones such as opals, garnets, rubies, and one diamond, all of which he found in the creek beds of the county.